Filed to: thanks obama!Filed to: thanks obama! 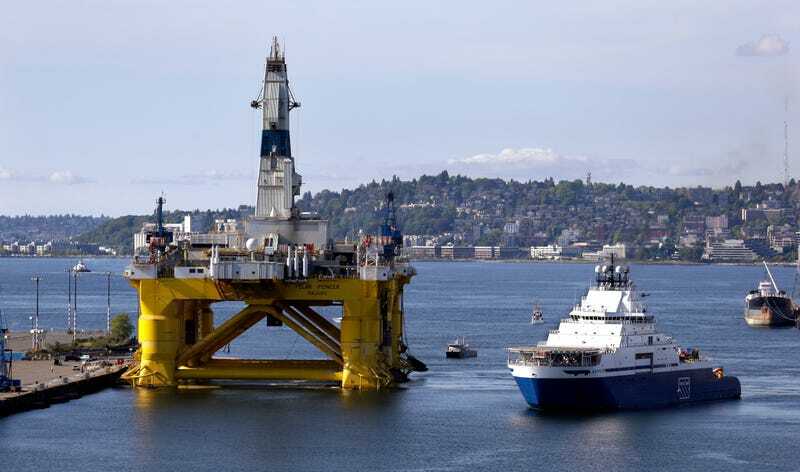 In a major victory for environmentalists, the Obama administration is expected to reveal a five year drilling plan that’ll significantly curb offshore oil and gas development in Atlantic coastal waters and the Arctic, The Guardian reports. Members of the Obama administration got ahead of the prez by making the announcement on Twitter this morning. The news is a dramatic about-face for the White House, reversing a decision Obama made last year to open up a vast new swath of Atlantic coastal waters to drilling. Is the president just being fickle? Not exactly. The new decision is quite fitting in light of our president’s recent crusade to save humanity and the planet on as many fronts as possible. Let’s review. In August, Obama unveiled the Clean Power Plan, the most significant climate policy document in US history. If enacted, it’ll compel power plants to curb their carbon emissions by 30 percent by 2030. In November, Obama put the kibosh on the Keystone XL pipeline after seven years of political wrangling over the project. In December, he helped broker the Paris Climate Agreement, an international pledge to end fossil fuel consumption by the end of the century. Over the past few months, he’s introduced a slew of outlandishly progressive energy ideas, including an oil tax, and banning coal development on federal lands. Last week, he closed a major regulatory gap regarding methane emissions from oil and gas infrastructure. The list goes on. Obama has also made it clear that the Arctic is a big part of his long-term climate strategy. He became the first sitting president to venture north of the Arctic circle last summer—a symbolic trip intended to raise awareness of rising sea levels and melting permafrost. Last week, Obama and Canadian Prime Minister Justin Trudeau sat down to talk energy and climate. They ended up making a joint declaration that all future oil and gas projects in the Arctic would be carefully vetted, with the environmental impact a primary consideration. The new five year drilling plan, to be announced by the Interior Department later today, is expected to double down on that promise. Stay tuned for next week, when the Obama administration unveils its formal plan to end El Niño once and for all by dropping a giant ice cube in the middle of the Pacific.